Make a Sea Breeze, delicious margarita, or fruity cocktail with this sweet and savory canned grapefruit juice! Boasting the tart yet ripe flavor of plump and ripe grapefruit, this juice ensures your customers will want to order another grapefruit-flavored beverage. Compared to other types of packaging, this canned juice provides convenient storing and stacking to keep your business in good supply. When ready for use, simply chill, shake well, and pour! Refrigerate after opening to maintain freshness. Easy to use and versatile, this luscious grapefruit juice features the appealing pale yellow color of freshly-extracted juice and clean, smooth taste. From breakfast beverages to evening cocktails, grapefruit juice is a great ingredient to have on hand throughout the day. It's sure to freshen up your patrons at your hotel or resort's breakfast bar or buffet. Mix it with other fruit flavors to create an irresistible, cool fruit punch for your next party or event! Use this grapefruit juice at your bar service to create a minty grapefruit mojito, a bubbly grapefruit sparkler, or trendy pink grapefruit martinis. These 5.5 oz. 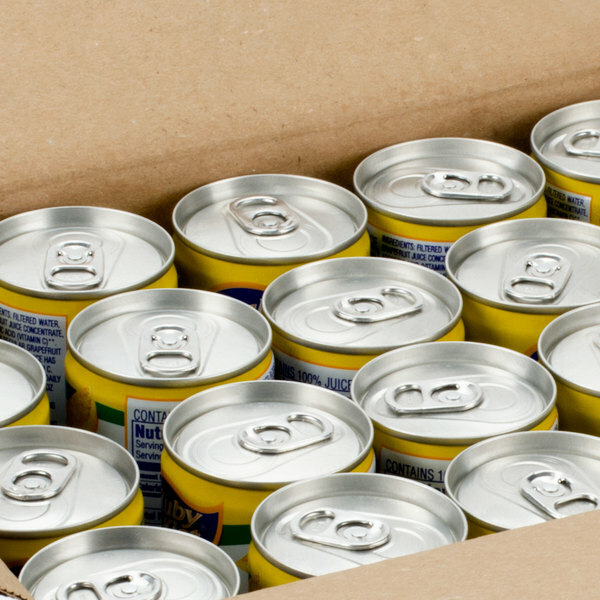 cans of orange juice are the perfect size for a single serving, while reducing waste from unused product in bulk cans. This Canned grapefruit juice case of 48 is an excellent buy for our bar. It really goes great as a mixer and the taste of the grapefruit juice does not taste too artificial. 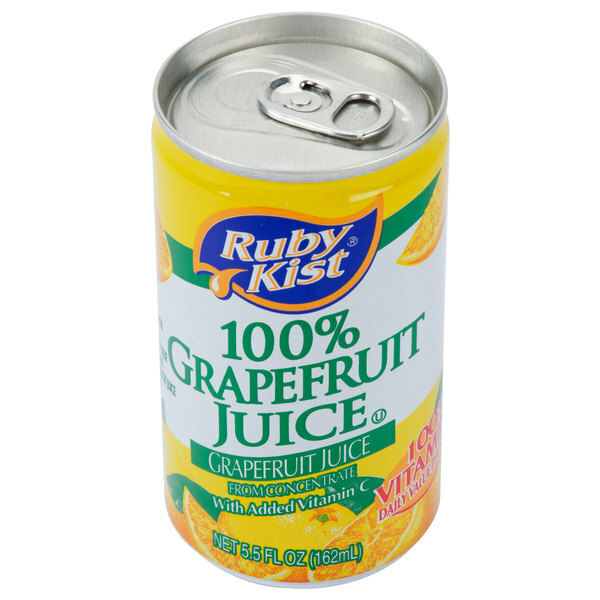 This canned grapefruit juice tastes really good. Great for making all kinds of cocktails. I have yet to find a grapefruit juice at a better price. Great sized Item with tremendous shelf life! Perfect mixer! A must have for any bar or restaurant. Price can't be beat for what you're getting. The canned grapefruit is really nice and refreshing. A great style grapefruit juice for enjoying stand alone or mixing for some wonderful cocktail. The juice is wonderful. This grapefruit juice is as good as the national brands available from our grocery supplier, and come in at a fraction of the cost! And in this perfect potion size, there is almost zero waste! Love the can and size of this grapefruit juice. Works great for our bakery and fits great in our cooler. The customers love the great taste of this grapefruit juice. This is a white grapefruit, provides a sweet punch and is enough to be used for 2 cocktails. I have had to purchase red grapefruit per guests requests. 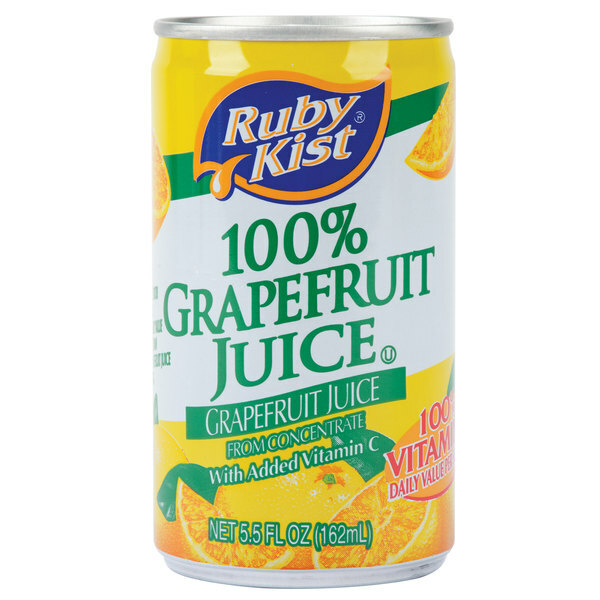 The 5.5 ounce canned grapefruit juice is delicious and makes for a great morning beverage choice. i love the great flavor and tartness of the juice. A nice style of grapefruit juice that is great for making our cocktails at night. My wife and I love the tart flavor and the perfect size can for single use. A really great price for these cans of grapefruit juice. The juice is sweet and tart making for a great breakfast juice or a cocktail mixer. The cans are really good quality. 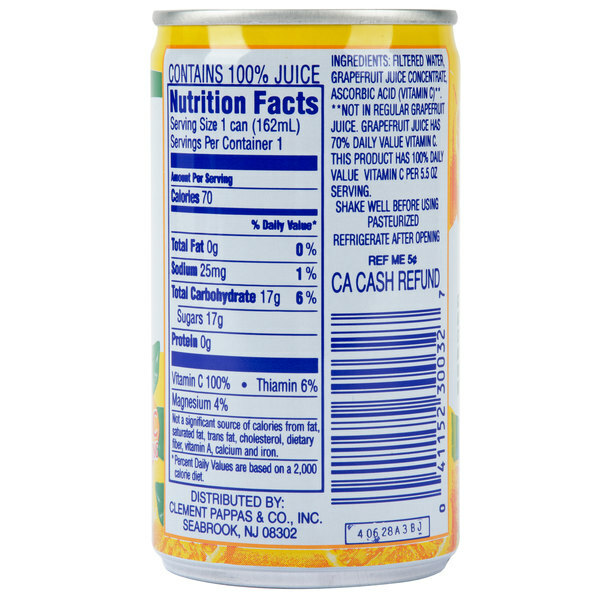 The canned grapefruit juice tastes wonderful and is a great balance of sweet and tart. The juice is great for breakfast and wonderful for making evening cocktails. Pink grapefruit juice, the perfect size for cocktails and a glass of juice without having to open large containers. Will definitely be buying again. Highly recommend this product. I love these mini cans of grapefruit juice. They are perfect for using at our brunch events and the taste is superb. We will definitely be buying again. Grapefruit juice is not used that often in our bar, so we got tired of having to pour out opened jugs that had been sitting around. We love these small canes. Perfect for single cocktail mixing and store well. These grapefruit juices are the perfect size for under a bar. Delicious flavor in a perfect single serving size makes for an absolute winner with this product. great taste though you can taste some can flavor, like any canned juice, but it's fresh and completely natural- it's so hard to find grapefruit without added sugar or corn syrup or other fruit sweeteners like fructose -this one is so natural it doesn't even have pear or apple juice mixed in0 wondeful! These cans are the perfect size for our mixed drinks. Also a great value, because they cost quite a bit more than this from local distributors. 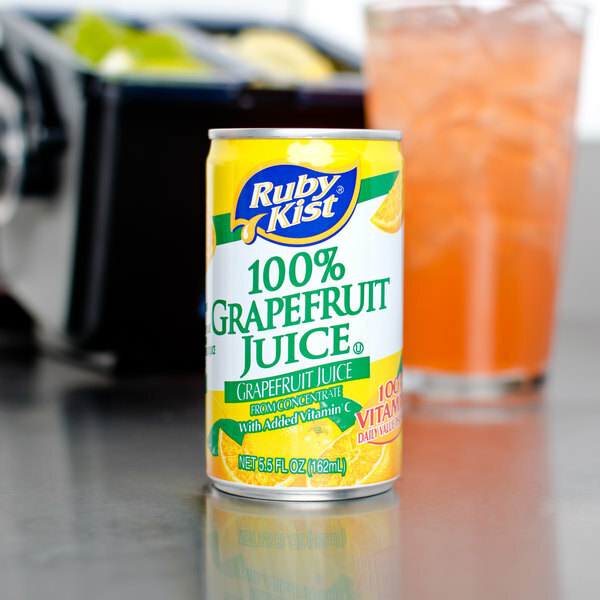 We love the convenience of these cute little cans of grapefruit juice that can use to drink or add to mixed drinks that prevent waste. These small cans are very useful for a variety of needs, including mixing with orange or pineapple juice for wonderful juice combos. And of ocurse, this is good grapefruit juice to drink straight. These little cans are perfect. Open one up to make a cocktail and you don't have to worry about waste. Great price as always on this website. These small cans are very convenient. You can open one for small batches of drinks or cocktail mixes without worrying about wasting extra juice like the large bottles. We don't use grape juice often, so these little cans are perfect. One of them is a perfect size for a mixer in a cocktail. Tastes fresh. Perfect for all of our cocktail needs. Doesn't need to be refrigerated so this is easy to store. I would highly recommend this item. This is some great tasting and great quality grapefruit juice at a great price! I absolutely adore the idea that they are in small cans so you dont have to use a large quantity at once so that it does not waste! I always have these around the house. This is a great product at a great price. The grapefruit juice is a nice quality and tastes pretty fresh. Great for cocktails in a polynesian drink. Great canned juice product! Good price! Excellent long lasting shelf life! Great to stock up on because refrigeration is not needed until the product is opened! Overall Great!!! Good size too! Great item to stock for my cocktails. Convenient size. I received my order promptly. The store has lots of other similar items that I am likely to buy in the future.